The first 2 is by far the most popular and probably also the most effective ways to save a ton of interest. However, both of them require you to use your own money to do this, but there is one method that don’t require your own money and this is by using the interest-free period on your credit card facility. In this article I will look at how you can essentially use the bank’s money to help you pay off your home loan faster by shaving a couple of years and a few R100 000 off your home loan. I’m a product designer and not a financial adviser, so be a smart human when you read or consider trying this out. I’m an FNB customer and will use their products as a reference but the same principle might apply to other banks (double check yourself). Because the method involves transferring funds in and out of your home loan, you’ll need a flexi-bond for this to work. If you’re reading this article it should be quite obvious why you want to pay off your home loan faster and that is to pay less interest. Because interest is calculated on a daily basis, the more extra cash you put into the home loan throughout the month, the less interest you will pay over the loan’s duration. This is also why many who, for example, receive their salary on the 25th, immediately pay it into their home loan, keep it there for 5 or 6 days and then pay it back into their transactional account before the debit order runs. This way they save on interest for a couple of days each month. As a fun side fact: With the example just mentioned, if you earn and pay R30 000 in and out of your home loan for ~5 days each month, you will roughly save R29 000 on a R2 mil home loan over a period of 20 years. Using a single facility thus helps you save interest not only for a couple of days each month but for the whole month, month in and month out. As you use your salary during the month, you will of course just save less and less interest each day until this cycle repeats itself with your next salary. It’s a very nifty product indeed. You need to be a private client and it is therefore only accessible to a small group of people. If an existing home loan is not in a Single Facility, you’ll have to go through the whole home loan application process and pay the initiation and transfer fees again. The total savings on interest over the full duration could possibly justify the re-application, but it hasn’t really been a big motivator for me as I know your credit card can simulate this facility without having to pay these fees again. Most credit cards come with a grace period where you don’t pay any interest. You can, therefore, in principle, use your credit card to simulate the functionality of a single facility. On month 1 Stacey pays her full salary minus her debit orders into her home loan. This is roughly R35 000 with the rest of her salary being made up of her home loan and other debit orders that goes off at the beginning of the month. Side note: You can pay your full salary into the home loan but you’ll have to transfer some money back into your transactional account again before your debit orders run to avoid attracting interest on these. Now, instead of running the remainder of the month’s budget from her salary as she normally would, she now runs it on her credit card’s interest-free period. This will allow her to save interest on her home loan for a whole month by having an extra R35 000 in it. But because she has 55 days interest-free period, she can repeat this process for month 2 by paying another R35 000 into her home loan. This means that she’s now saving interest by having an extra R70 000 in the home loan while living on her card’s 55-day interest-free period. Once she reaches day 55, she’ll have to clear her credit card to ensure no interest accrues on the credit she used. Over this 55 day period, Stacey saved R741 on her R2 mil home loan. 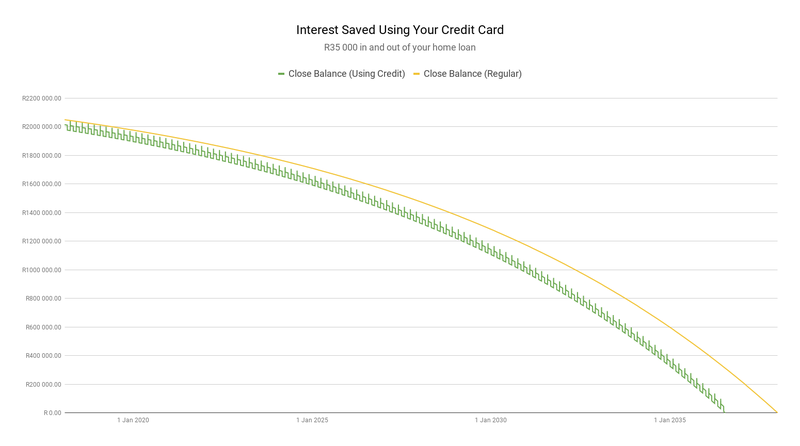 It’s not a lot though, but over a period of 20 years she will cut her home loan by 18 months and save R264 000 in interest. Here’s what it looks like on a graph. Cool pattern on the green line there, hey? There’s a minimum payment on your card statement each month. If you fail to pay this by the due date, the 55-day interest-free period will be suspended and you will start paying interest on the credit used as well as all transactions from that point onwards. One of the most important things to remember about using this method is that you’ll have to keep track of your money. If you can’t keep a budget, this method is probably not for you. My experience is that it really takes a lot of disciplined tracking with a budget to ensure you don’t spend more than you should. My wife and I had to re-engineer our whole budget to make this work for us. The great thing about this process though is that it forced us to find a better way to budget and manage our money. Of course, all of this wouldn’t have been necessary if FNB’s Single Facility didn’t require us to go through the whole application process again. For those who are interested, we are currently using TillerHQ to budget our money. They use Yodlee’s API (the same company used by 22Seven) to pull in our FNB transactions into a Google Sheet. On top of this, we’ve created a very simple calculator that keeps track of what are savings and what’s credit in our home loan.